When: Thu., May 2, 8-9:30 p.m.
We Got Next Comedy is ecstatic to present A Night of Comedy at Enix Brewing. 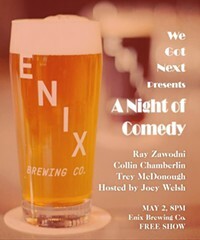 This show will be co headlined by Ray Zawodni and Collin Chamberlin. Trey McDonough will also be featured as well. This is our first show at Enix and its gonna be a good one. The show will be on their gorgeous patio so come enjoy some local comedy under the stars! This is also a FREE SHOW!